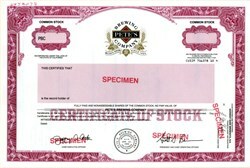 Beautifully engraved specimen certificate from the Pete's Brewing Company . This historic document was printed by the Security Columbian Banknote Company and has an ornate border around it with a vignette of the company's logo and the words "Wicked Brews Since 1986". This item has the printed signatures of the Company's officers. Pete's Brewing Company was founded by homebrewer Pete Slosberg and Mark Bronder in 1986. Its major product line was Pete's Wicked Ale, an American Brown Ale that is 5.3% alcohol by volume. The company was acquired by The Gambrinus Company in 1998, a company that owns the Spoetzl Brewery in Texas, the Bridgeport Brewery in Oregon and the Trumer Brauerei in Berkeley. In 2004, Pete's Brewing Company was number 42 in America for sales by volume. Slosberg and Bronder were among the pioneers of the craft beer movement in America, along with others such as Jim Koch of Samuel Adams, Fritz Maytag of Anchor Brewing Company in San Francisco and Larry Bell of the Kalamazoo Brewing Company, now Bell's Brewery Inc. These upstart brewers committed to using all-malt recipes, and to highlighting the hoppy flavors in their beers. Their approach stood in contrast to the larger U.S. breweries, which commonly use adjuncts such as corn and rice to replace malt as an inexpensive fermentable sugar. The signature product was largely responsible for establishing the American Brown Ale as a commercially viable beer style and category for beer competitions. The entire product line was brewed under contract by Matt Brewing Company in Utica, New York. Slosberg is a graduate of Columbia University's School of Engineering and Applied Science.